This giveaway has ended — and so has the SUPER HUGE Michigan Wine Month Giveaway! Thanks for playing! 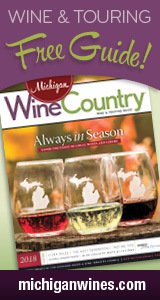 Today’s Question: Our website, MichiganByTheBottle.com, promotes the entire Michigan wine industry; at our tasting rooms, we're partnered with a handful of Michigan wineries to bring a taste of the wine trails closer to Metro Detroit. If you've visited us before, what's your favorite memory from visiting us? If not, why do you want to visit us? Today's Prize: A one night, midweek stay at the Inn (dependent upon availability), a winery and farm tour, lunch at the Hearth & Vine Café (opening 7 days a week after Memorial Day weekend) and an expanded VIP tasting in the exclusive Barrel Room. Today’s Question: If you could bring any friend/relative to stay with you at the Inn at Black Star Farms and join you on your tour and tasting, who would you bring? Tag them in the comments! Today's Prize: A stainless steel 64 oz. St. Ambrose growler + 10% off the first fill of any of their 12 products on tap. Today’s Question: St. Ambrose's most popular products on tap are their draft-style (carbonated) mead, and the most in-demand flavors are Wild Ginger (ginger and honey), XR Cyser (apple & honey), Razz (sour raspberry and honey), Evil Twins (cherry and ginger) and Black Madonna (sour blackberry and honey). Which would you choose to fill your growler and why? Today’s Question: If you could enjoy a glass of Warner Vineyards wine with any author, who would it be and why? Today's Prize: A vineyard tour for up to 6 people, along with a complimentary wine tasting, June -October. Today's Prize: Wines of the Great Outdoors package: includes a zip-up hoodie, two campfire mugs (perfect for sipping wine fireside!) and a multi-tool (includes corkscrew, flashlight, etc.). Prize will be mailed to winner. Today’s Question: If you could put any wine slogan on a T-shirt to describe you and your love for wine, what would it be and why?